Alcatraz is located in California, in San Francisco Bay, approximately three miles east of the Golden Gate Bridge within the Golden Gate National Recreation Area. The site consists of a rock terrace (approximately 3-4 m wide) at the base of a 10 m cliff on the SW end of the island. Plots are located along the terrace and transects remain submerged until peak low tide. 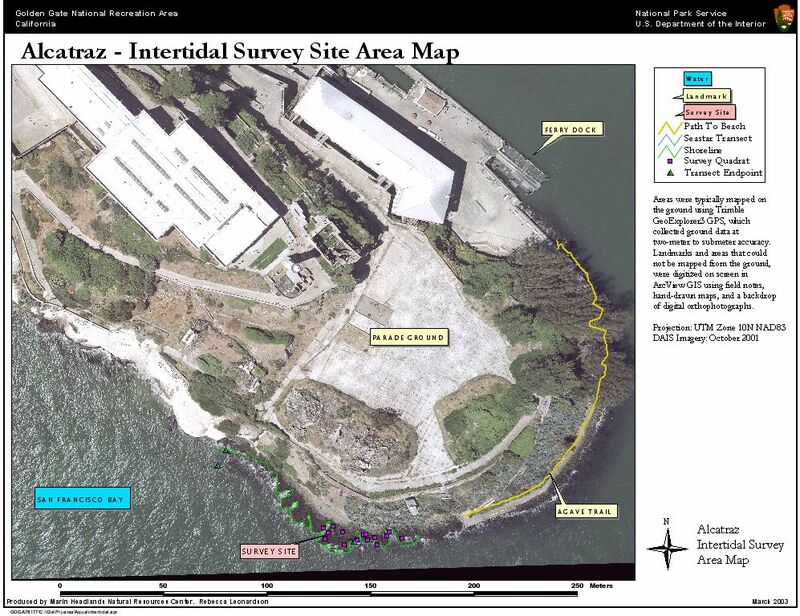 Long-Term Monitoring Surveys at Alcatraz were established in 1989, and are done by the San Francisco Bay Area Network of the National Park Service's Inventory and Monitoring Program. Long-Term MARINe surveys currently target the following species: Chthamalus/Balanus (Acorn Barnacles), Fucus (Northern Rockweed), Mastocarpus (Turkish Washcloth), and Pisaster (Ochre Star). In addition, motile invertebrates are monitored at this site. 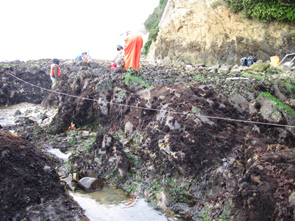 Click here for detailed intertidal monitoring protocols and additional information about the intertidal habitats of the San Francisco Bay Area National Parks. Click here to view Long-Term trends at this site. Biodiversity Surveys were done by University of California Santa Cruz in 2005 and 2009. The Biodiversity Survey grid encompasses one section that is approximately 32 meters (along shore) x 15 meters (seaward). Click here to view Biodiversity Survey findings at this site. This site was also sampled in 2007 and 2009 as part of a Natural Resource Damage Assessment (NRDA). For more information about Alcatraz, please contact Darren Fong.